The FGS 2011 Conference was a whirlwind of activities, and as exhausted as I am (even after being home for a few days), it was well worth it. Since this was my first national genealogy conference, I had to of course see how many ribbons I could amass. By the time I left on Sunday, I had 28 ribbons, which reached my ankles. If I didn’t have the longest tail, I’m sure I was a close second. Sadly, it reminds me how much I spend on genealogy (albeit, for me, well worth it) since all of the membership ribbons are legit (I didn’t take anything that I didn’t belong to). I don’t typically spend much time in the exhibit hall at conferences. I usually take in as many sessions as I can, but this conference was a different experience for me. I found the exhibit hall to be my networking hub and spent more time there then I would’ve bet on one week earlier. I visited about 75% of the vendors over three days. I learned about a variety of new products and services that I was previously unaware of, and learned about new offerings from familiar vendors. Look for blog posts later this week about some of my favorite vendors and interesting news items. I had a blast talking with everyone I came in contact with. One of the benefits of being on Facebook and having a blog is that I already knew so many people before having ever met them in person. Most everyone was as I imagined. And of course I met some new friends and I look forward to growing those relationships. Overall, FGS 2011 met or exceeded my expectations. I really do encourage you to attend a national genealogy conference if you have never been to one. There is so much to learn and so many wonderful people to connect with, you are at a disadvantage if you don’t. 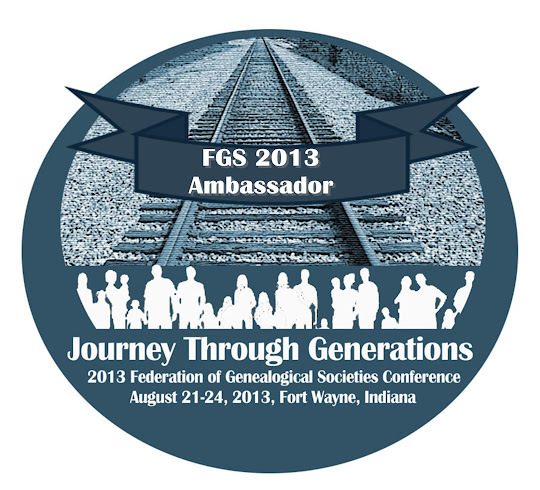 If you weren’t able to attend FGS 2011, you can purchase conference recordings of the sessions. (Note: Not all sessions were recorded.) Recordings can be purchased at Fleetwood Onsite Conference Recording. I've enjoyed all your FGS posts! Great job! I'm suffering from ribbon envy. This tradition was new to this Aussie at Rootstech this year. I'm already getting organised with paraphernalia for Rootstech 2012.